Our updates for Cumbria have now finished for the day. We'll be back with more updates from 08:00 on Friday. Have a good evening, and if you're sitting upstairs, with the downstairs drying out, we hope it's not too bad. If you want to get in touch email us or tweet us @BBC_Cumbria or contact us via Facebook. Breezy with scattered showers overnight, these falling as snow over the peaks of the Fells and North Pennines. Becoming mainly dry and cold later in the night with a frost in sheltered locations around Keswick. We'll see how the community of Glenridding has been coping after being hit by flooding for the second time in days and how children whose families have been affected by the floods are coping. And the Labour leader Jeremy Corbyn has been to Cumbria to see for himself the damage caused by the floods. Join me for these and all our other stories on BBC One at 18:30. The Met Office has issued an advance yellow warning (the lowest level) for the weekend. Meterologists say the track of this storm is uncertain, so the rain could fall as snow above 200m (650 feet). Between 20mm to 40mm (up to 1.5 inches) of rain is predicted. 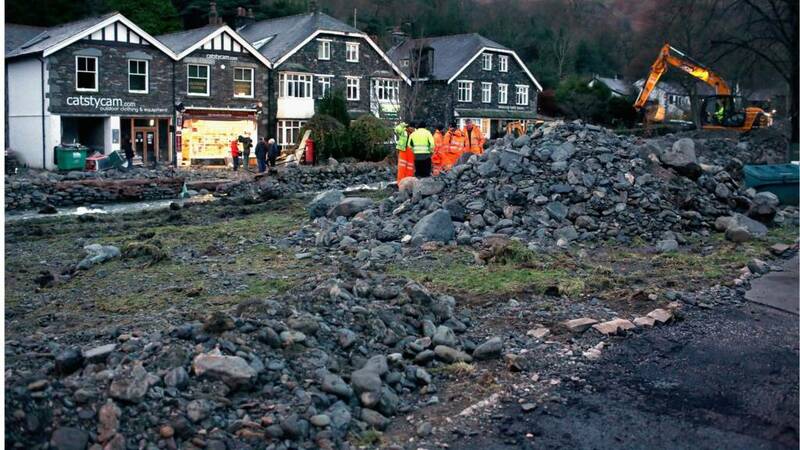 The community spirit in Glenridding was described as "stunning" as people pulled together to cope with the aftermath of the floods for the second time in days. Resident Emma Edgar said: "I think we are a credit to ourselves. I've seen 10-year-olds with shovels, no-one seems fazed - you just get on with it and everybody has been grafting." Jon Holdsworth said: "The community spirit is stunning, and the last few days have been awful and amazing all at once." Pantomime Cinderella will start at The Sands centre, in Carlisle, on Sunday after a team of staff and volunteers cleaned it up after the floods. The show starring former Three Degrees singer Sheila Ferguson was due to open on Friday. However, the first three shows had to be cancelled. Executive Producer Jonathan Higgins said: "We’re so grateful to all of the fabulous people who have dropped everything to help us get the show open. We want to help give families a sprinkle of panto magic during this difficult time”. Cumbria County Council is setting up a helpline for families with children at school, who've had to move into temporary accommodation. Officials say that with 6,000 properties affected, they believe many children may now be living miles from their normal school. Parents should ring 01228 221582 or fill in an online form.There's also an email address. Schoolchildren in Carlisle have been talking about how they are coping with the trauma and upheaval caused by the recent flooding. Nearly three quarters of the children at Norman Street Primary have had to leave their flooded homes. Since the flooding started, staff at the school have been offering free breakfast and after school clubs for any children who need them. And the efforts of all the staff have clearly been appreciated by some of the pupils. People in Glenridding and Borrowdale have been told they should boil drinking water as a precaution. Flooding in both areas has ruptured pipelines, meaning contaminated water might have got in. In Scalehouses, south east of Carlisle, 80 properties are without water after a pipe burst. A tanker is being provided. Water company United Utilities has more information here. A couple got married in Glendridding today despite the floods which tore through the village. Yvette and Simon Holden, from Chorley, Lancashire, arrived at the Inn on thr Lake on Wednesday. They said they would be spending their first full day as husband and wife helping out residents and "doing what they could". They said the vast majority of guests got to the wedding on time despite initial worries that the roads would be impassable. Electricity North West said most remaining properties that are still without power are also likely to need private electricians to carry out additional checks to ensure that customers' internal wiring is safe. Some properties will also need new electricity meters to be installed by suppliers. Owners of flooded properties that are still without power are asked to contact Electricity North West to arrange access as soon as possible on 0800 195 4141. Repairs to Cumbria's power network are expected to be completed today, Electricity North West said. It said teams from the electricity network company have been working round the clock to restore power since the severe floods hit on Saturday. There are now fewer than 1,000 properties without power and engineers, along with electricity suppliers and electricians, are carrying out door-to-door checks on electricity equipment before being able to safely restore power. Andy Brown from the Environment Agency, who's involved in the clean-up operation in the town of Glenridding, said it was a huge undertaking. He said: "This is just an unprecedented event like nothing we've ever seen here so I think we have been stretched to our limits, and we've called in resources from everywhere, from all over the country. "We've got nearly 150 extra staff drawn in, we've got kit, equipment, we've got the Army, we've got all different organisations." Community health service staff say they are getting back to normal - although in some cases, home visits are only with the help of police and mountain rescue volunteers. The specialist staff who deal with mental health, children's services maintained priority work through the storm, according to the Cumbria Partnership Trust. A spokeswoman said that people shouldn't worry if they'd been unable to make an appointment, as patients would be booked in again if necessary. The Al Imdaad Foundation, a charity linked to mosques in Blackburn, was among the charities arriving in stricken parts of Carlisle.